Collect electronic signatures in your WordPress forms. Your users may draw their electronic signature with a trackpad/mouse or just type it. In your WordPress admin, go to 'Formidable' → 'Add-Ons' and click the 'Install' button for the WordPress Signature plugin. Once the Signature add-on is installed it will appear in the right sidebar under the Pro Fields section. Go to edit the form where you would like to use the Signature field. Find the 'Signature' field and click or drag and drop it into your form. Save the form and click 'Preview'. Now when the form is visited, the Signature field will appear and be ready to use. Set your own text for the Draw It, Type It, and Clear labels. If you would like to hide the Draw It and Type It tabs then select 'Hide Draw It and Type It tabs'. Display the submitted electronic signature image in a form's confirmation message, email, or View. Just insert [x], where x is the ID or key of the signature field. To show the image URL alone without the img HTML, use [x use_html=0]. When the form is saved, the electronic signature is saved in an image. Larger signature pad dimensions require more memory. You can either increase the memory limit on your site, or decrease the image resolution. The GD library may be missing on some servers. This library is required for the signatures to work. If your server is missing the library, you will get an error after form submission or when viewing an image. The error message shown will be 'call to undefined function imagecreatetruecolor()' if this is the case. To solve the problem, contact your web host and ask if they can install this library on your server. These code examples can be added to your theme functions.php file or a new plugin. If you want to insert code into your theme functions.php, add it at the very end of the file, before the last ?> if there is one. If you plan to update your theme, be sure to put it in a new plugin so the code won’t be lost on update. 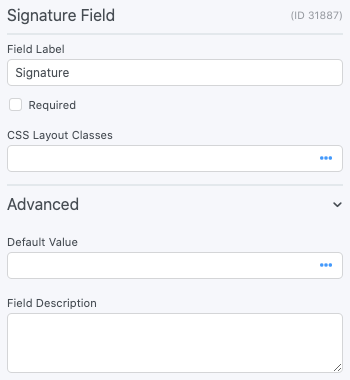 This example allows you to change the multiplier for signature fields. A higher multiplier will create a clearer signature, but it also takes up more memory. The default multiplier is 5. This example allows you to change the default location for your signature field's image. The default location is /formidable/signatures/. When the signature image is created, the colors can be customized using the example below.